Large and fuzzy with a black and yellow coating, bumble bees pollinate crops and wild plants. They tend to nest in dark, secluded cavities like empty animal burrows and mouse nests. They are not very aggressive insects and usually only sting when provoked or when defending their nest. Honey bees are light brown with light and dark stripes. As their name suggests, they produce honey and and help others in their hive locate nearby flowers They make their homes in hollow structures and voids, like walls, attics, crawl spaces, holes of trees and rock crevices. While they can only sting once, honey bees release a pheromone alert with every sting that recruits other workers to defend the colony. Carpenter bees look like bumble bees but have a black, shiny and hairless abdomen. These bees are wide-ranging pollinators, reaching a larger variety of plants for longer periods of time than other bees. They actively excavate tunnels in wooden structures such as decks, siding and porches. Females can sting but will only do so when agitated, and males aren’t capable of stinging. 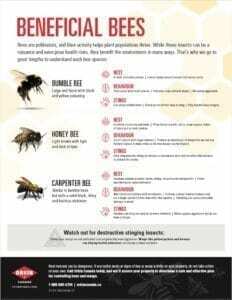 Want the full scoop on which bees are most beneficial? Download Beneficial Bees to learn more!